New research from Case Western Reserve University (Cleveland, OH) shows that magnetic resonance imaging (MRI) can detect the earliest signs of breast cancer recurrence and fast-growing tumours. The new MRI technique detects micrometastases, breakaway tumour cells with the potential to develop into dangerous secondary breast cancer tumours elsewhere in the body, according to the study published in Nature Communications. The study pushed imaging boundaries, revealing smaller cancers than can be detected with current clinical imaging modalities, according to lead author Zheng-Rong Lu, PhD, CWRU M. Frank Rudy and Margaret Domiter Rudy Professor of biomedical engineering and an expert in molecular imaging for cancer and other diseases. "We showed with this technique that we can detect very tiny tumours of just a few hundred cells," says Prof. Lu. "Our imaging technology has the potential to differentiate aggressive tumours from low-risk tumours. These are two things that potentially can make a big impact on clinical practice and also management of cancer." To detect micrometastases — which are often too small to be detected with standard screening — Prof. Lu's team used MRI imaging and combined it with a special chemical contrast solution. The contrast material contains a short piece of protein, or peptide, tagged with a minuscule magnet. The team chose the peptide (a chain of just five amino acids) for its inclination to bind to protein matrix structures around cancer cells, called fibrin-fibronectin complexes. Also, the fibronectin part of the complex is expressed during a cell's transition to cancer and plays a role in cell growth, migration and differentiation. Fibronectin is associated with high-risk breast cancer with poor prognosis, the team notes. The research team tested the technique in mice into which they had introduced breast cancer cells. After a two-week waiting period, the team injected the contrast solution and performed MRI. 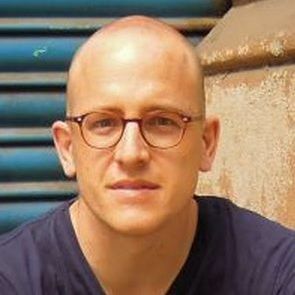 Metal molecules within the contrast solution were magnetised during the MRI process and enhanced the image wherever the molecules of solution bound with the targeted protein. The MRI imaging detected metastatic tumours, including micrometastases, in liver, lung, lymph node, bone, adrenal gland, and brains of the mice. Analysis of images revealed that the contrast used by the research team bound almost exclusively to the fibrin-fibronectin complexes, producing a strong and prolonged image enhancement of micrometastases and tumours compared with normal tissue. 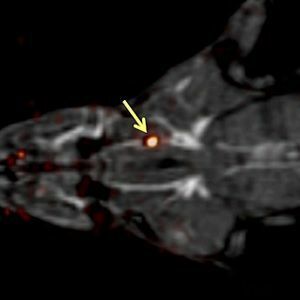 Using a microscopic imaging approach ("cryo-imaging") and MRI, the team verified that the MRI technique could detect micrometastases, even observing bone micrometastases that were less than 0.5mm — the diameter of a very fine pencil lead. "We think this targeted approach holds great promise for earlier imaging of high-risk cancers in the clinic," Dr. Liu points out. 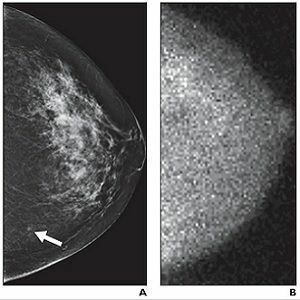 "It could also become useful as a non-invasive way to assess breast cancer treatment progress." Based on separate studies that the team had previously conducted, the contrast agent is readily cleared from the body and has a low level of retention in tissues. The team plans to complete safety testing of the imaging agent during the next three years. They will then pursue human trials with this approach. healthmanagement, MRI, micrometastases, fibronectin, breast cancer, tumours, peptide New research from Case Western Reserve University (Cleveland, OH) shows that MRI can detect the earliest signs of breast cancer recurrence and fast-growing tumours.